For freelancers and agencies who provide social media services, having a proposal ready for your client should be an essential part of your workflow. We’ll walk through the important components of a social media proposal, aided by tips from people who write proposals on a daily basis. Hopefully by the end of this article, you’ll be able to write your own or make tweaks to an existing template. Where Does a Social Media Proposal Fit into Your Workflow? 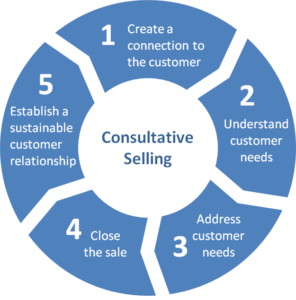 The proposal is part of your sales process. Vantage Point Performance and the Sales Management Association found that companies with a clearly defined sales process see 18% more revenue growth than companies that don’t. 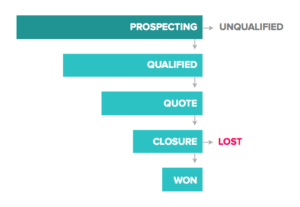 What is a clearly defined sales process? It’s made up of stages, such as “prospecting” and “close.” It can resemble a pyramid, flow chart or even a circle. Below are three examples of different sales processes. The number of stages differs from company to company. 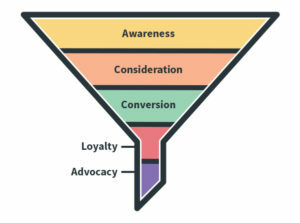 What is more important here is that each stage has clearly defined actions and metrics that are relevant to you. Having a clearly defined sales process not only makes you look more professional, but it also helps you manage your workflow. If you’re having trouble building an effective process, check out our Agency Partner Program. As a member, you’ll get access to tools, sales collateral and resources to streamline your process, win new business and prove social ROI to your current clients. View our free social media proposal template doc and simply click “File” and “Make a copy” to edit your own version! What’s the Purpose of a Social Media Proposal? A social media proposal formalizes your ideas to your client. It’s not a contract (though it can be if you want it to be). This stage often comes after a consultation and/or research on what the client needs. Let’s say you want to change up the look of your kitchen. You have a general idea of what you’re looking for, but you don’t have the knowledge to make your dream kitchen come to life. Your next logical step is to hire an interior designer and if you do your due diligence, you’ll find a few people who might have the experience you need. You’ll ask for proposals and after looking at what they send you, you’ll make a decision. The tricky part of writing a proposal is that you need to persuade the client of your abilities without outlining every step. An interior designer won’t send you three different kitchen designs, complete with sample materials in their proposal. Nothing could stop you from taking their design and executing it on your own. Instead, the designer would need to demonstrate industry knowledge and an understanding of your needs. Based on their recommendations and their portfolio, you’ll be able to make an informed decision on hiring them. What’s in a Social Media Proposal? As we mentioned before, a proposal needs to demonstrate an understanding of the client’s needs. We’ll go into each part in detail. An important part of a client relationship is managing their expectations. In the client consultation, you should be able to understand what their needs are for social media and how you can help them. Oftentimes, clients will recognize that they need help in social media management, but are unable to describe why they need it or what their goals are for using social media. For example, if the client wants to use social media to increase their sales, this proposal section would include current sales metrics and an analysis of why the current strategy doesn’t work. This section closely matches your contract’s Scope of Work section. Essentially, everything that goes here is what you will do for your client. This is the biggest part of the proposal and can be broken into smaller pieces. Posting schedule: Which networks are you going to be monitoring and how often will you be posting? If a posting approval process is needed, then be sure to outline what that would look like. Content creation and curation: This can include creating a social media content calendar, taking photographs and keeping a pulse on industry news. Brand keyword monitoring: Be sure to note which keyword(s) you will be tracking. Analytics and reporting: How often will you be reporting on analytics and what will you be tracking? 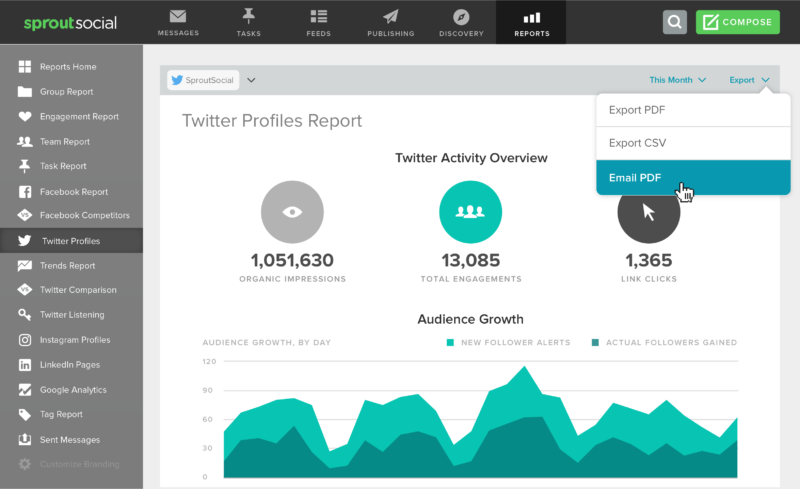 Social media management details: When will you be available to engage on social media? How much time will you be dedicating to the client? Our product can make a social media manager’s life easier. Not only do we offer easy keyword monitoring, but our reports come presentation-ready and can be exported at a click of a button. Often looped in with Scope of Work, this section will clearly define how you measure a project’s success. If the client wants more brand exposure from social media, you’ll likely identify impressions and reposts to be part of your metrics. With their current numbers and growth rate in mind, you’ll be able to write reasonable, numeric goals in the proposal. Why should you be the one to work with this client and not your competitor? What makes you stand out from all the others? Chances are that the client is receiving multiple proposals for the same project. This is where you demonstrate how your experience would fit into their needs. It can come in the form of client testimonials or examples of how you’ve successfully managed clients with similar goals. This is the nitty-gritty of the proposal. The section should clearly communicate how you work and what the contract terms would be. The termination goes both ways: the client can end the project if it’s not working out for them, as long as they know they still need to pay the kill fee. What’s next after the social media proposal? To avoid limbo and a continual back-and-forth between you and the client, write down what happens after the proposal is sent. Will you be following up after a certain number of days? Does the client have a chance to ask for revisions on the proposal? While these are major components of a social media proposal, there are countless other ways of writing a proposal. Some agencies like to include an expiration date on their proposals along with a copyright notice. Proposal length can vary depending on the client you’re working with. A proposal for a small business would look remarkably different from a proposal for a multi-million dollar company. For many social media marketers, a digital delivery of the proposal is sufficient enough. For others, you may need to make an in-person presentation. Just like when you write and design a resume, make sure your proposal is easy to read for the client. With all of this in mind, you should be able to create your own social media proposal template. Services like Canva have presentation-ready templates that can be adapted for a proposal. Having a template will make new proposals easier for you, leaving you to focus on writing the details. Having a well written proposal is great, but it doesn’t guarantee success. If you’re an agency or consultant looking for help to sell or grow an account, speak with one of our agency partner growth consultants.